Havasupai Flood. Havasu Canyon was devastated by a flash flood in August 2008, which destroyed the campground and bridges, uprooted trees, and permanently changed some of the canyon's famous natural features. A change in the streambed has left famed Navajo Falls dry. Fifty-Foot Falls is now 75 feet tall. Havasu Falls is now a single spout of water. Iconic Mooney Falls remains intact but most of the pools and lagoons below it have been washed away. Havasu Creek has regained its turquoise color. Efforts are being made to re-establish some of the travertine pools and fortify the stream banks. An early-warning system for future flash floods has been established. The canyon reopened to tourists on June 1, 2009, and tourism has been returning to normal. Located on the land of the Havasupai Nation, Havasu Canyon is a tributary of the Colorado River, renowned for a series of spectacular waterfalls and turquoise, travertine pools in Havasu Creek that attract thousands of visitors every year. The tribal members are the only permanent inhabitants of the Grand Canyon. Their only town, Supai, is on the banks of Havasu Creek within the canyon. Supai and Phantom Ranch are the only two locales in America receiving mail by "pony express" (actually, mule train). The long, tedious trail into Havasu Canyon starts on Hualapai Hilltop, reaching the village of Supai in eight miles, and an additional two miles to the campground. The popular waterfalls and pools are in the next three miles. From Beaver Falls, the most downstream falls, it is five more miles to the Colorado River. Therefore it's a total of 18 miles one-way from the hilltop to the river. Hualapai Hilltop is reached via BIA-18 which leaves Route-66 a few miles east of Peach Springs. It is about 60 miles (96 km) to the trailhead along BIA-18. Permits are required from the Havasupai Tribe to enter the canyon. You can hike the trail or arrange to reach the Supai village by horseback or helicopter. The tribe also offers service to carry in your gear via mule train. There are also horseback day tours from the village to the popular waterfalls. Visitors may stay at the large primitive campground (daily fee for camping) or the small, very rustic motel in the village. (You may want to review the reviews of Havasupai Lodge at tripadvisor.com.) There is also a small cafe and convenience store. Reservations should be made well in advance for all services (info below). The Havasupai Trail. The most difficult part of the trail are the switchbacks going steeply down the canyon wall below Hualapai Hilltop. It is of course the most strenuous part of the return trip. The route crosses the plateau and eventually follows a dry streambed which reaches Havasu Creek a short distance upstream from Supai village. The first falls, Navajo Falls, is just over a mile below the village. Look for a side trail on west side of the creek which goes through the trees to the falls and its main pool. The area is secluded and offers easy access for swimming. Havasu Falls is just downstream before the campground. A side trail goes right, over a small plateau to the main pool. There is a famous vista point looking down at the falls. Havasu is the most well-known of the falls and the most-visited. Much of the travertine was washed away during floods in the 1990s. Swimming is allowed, and there are picnic tables across the creek. Mooney Falls is just past the campground heading downstream. The trail passes an excellent vista point for the 210-feet high falls. There is a very difficult and exposed trail down the cliff to the pool and the bottom of the falls. There are chains, handholds, and ladders on the cliff face. You must descend this trail to continue further downstream. The next three miles to Beaver Falls are strenuous with several stream crossings. Beaver Falls is actually several smaller falls. Swimming is still possible in its pools. The trail further downstream to the Colorado River is also very strenuous and recommended for experienced hikers only. Official Website of the Havasupai Tribe. 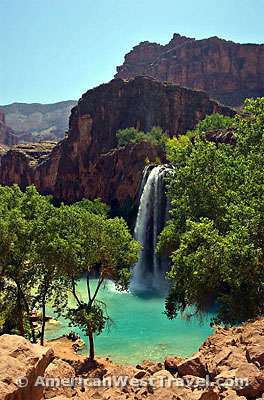 Has contact information on services in Havasu Canyon including pricing and reservation information for visitor permits, campground, motel, horseback and mule services. Wikipedia - Havasupai. Has an excellent narrative describing the trail in detail. Continue further down the page - where the four major falls are discussed in detail, including the side trails which access them.